The BMW India Bridal Fashion Week is a high profile bridal couture show held with grand bridal wear displays from the crème de la crème couturiers of the country. BMW is partnering for the second consecutive year with the India Bridal Fashion Week, taking the premium show a notch up. The BMW Fashion week also promotes trade of bridal couture wear and offers a platform for the designers and the buyers to link up through the Bridal Luxury Couture Exposition. 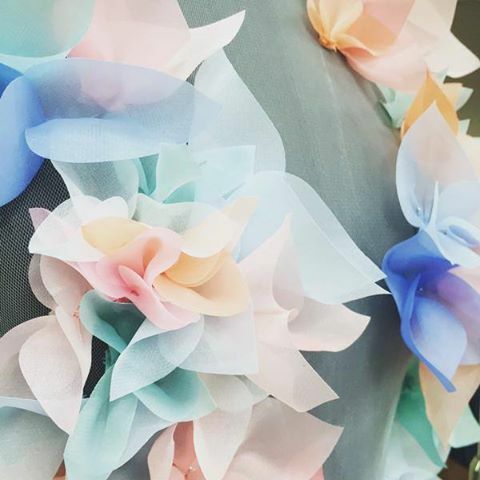 This trade show displays, bridal women’s wear, men’s wear, jewellery and accessories from leading as well as emerging designers in a large set-up, over three days. 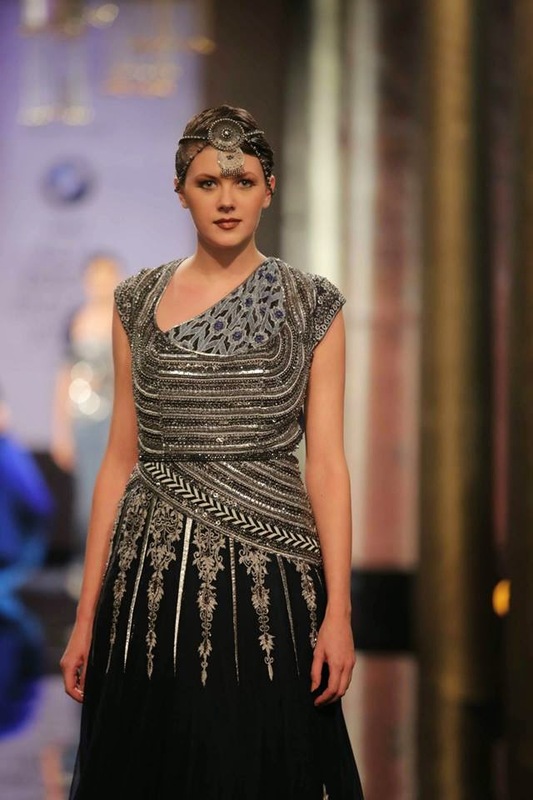 In 2014, the BMW Fashion Week was held at the DLF Emporio, Vasant Kunj, New Delhi between Aug 7 and Aug 10. 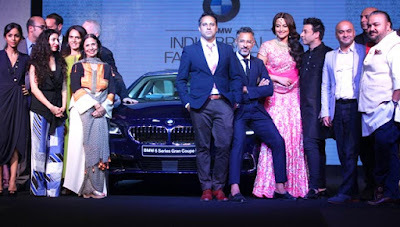 This year, looking resplendent in a pink Suneet Verma bridal lehenga and jadau jewellery, Sonakshi Sinha, the face of BMW fashion week 2015, gave us the first look of the event on 29th May 2015. This preview gala of the event held at New Delhi, offered an insight into what we can expect at the upcoming show. 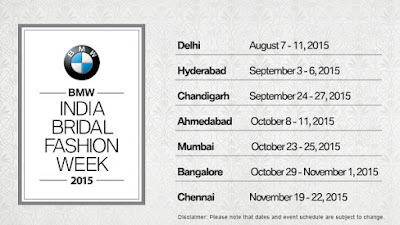 The BMW Fashion Week 2015 is an initiative of Fashion One International and the unique factor about the show this year is that it will be travelling across the seven cities of India, including Delhi, Mumbai, Bangalore, Chennai, Hyderabad, Ahmedabad and Chandigarh. So it has a much larger platform of demonstration as well as trade this year, reaching out to buyers from every nook and cranny of the country. 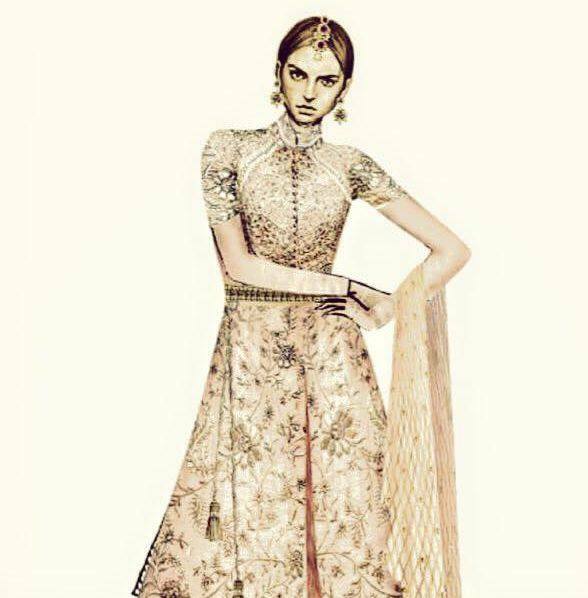 Abu Jani – Sandeep Khosla: Abu Jani – Sandeep Khosla will be opening the show at New Delhi on Aug 7th 2015. 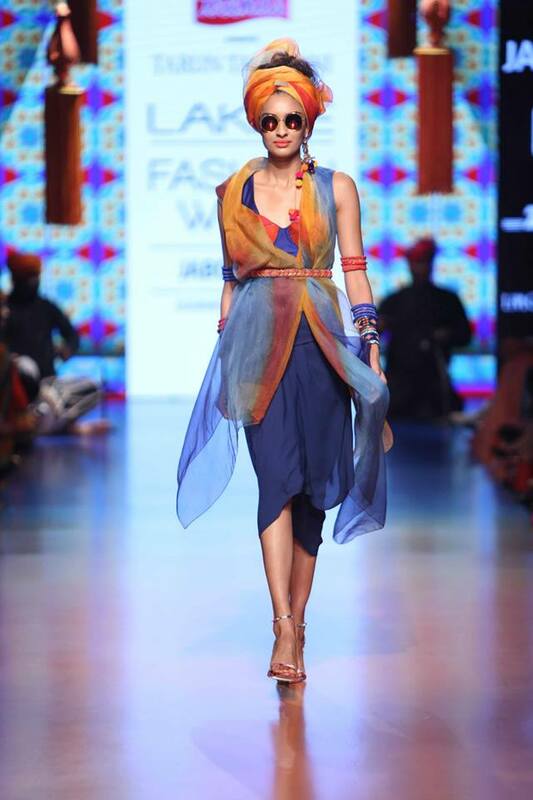 The designer duo are bringing forth “the Varanasi” collection at the BMW Fashion week. Their line of Banarasi weaves is interspersed with georgette and khadi. The runway will see more of pinks, reds, oranges and yellows taking inspiration from the bold colours of the holy city. 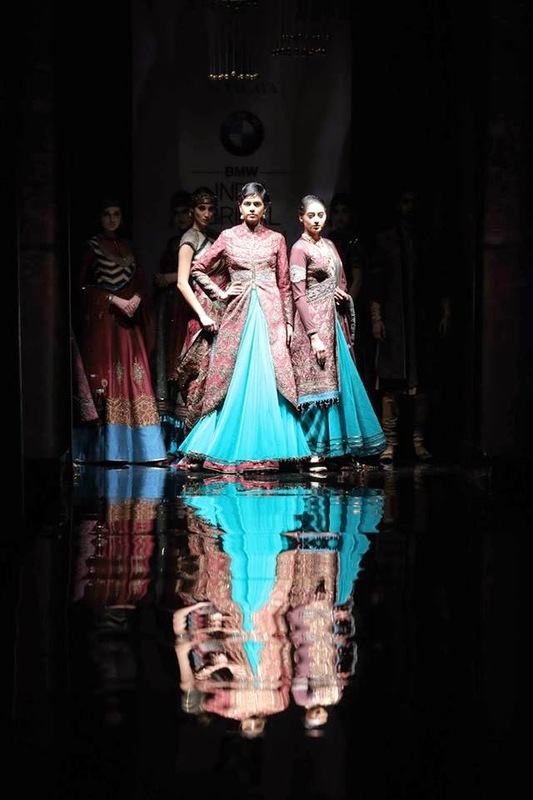 Suneet Verma: The New Delhi show’s Finale will be at the DLF Emporio under Suneet Verma. The designer has given a glimpse of intricate embroidery on navy blue saree and lehenga, which will be up on Harpers Bazaar Bride too and also a peek of mirror worked red bridal attire. J J Valaya: The pro bridal wear couturier will present his collection “Bolshoi Bazaar” at the BMW Fashion week, so we expect to see some Russian inputs to the Indian elegance. Nitya Arora, the accessory designer behind Valliyan has confirmed that her headgear will be seen on the models wearing Valaya’s collection. Tarun Tahiliani: The 2014 show had an apt opening runway performance called “The Modern Mughals” under the helm of Tarun Tahiliani. This year he is going to present a myriad of colours at the BMW fashion week 2015. His sneak peek keeps the colours under a wrap, displaying a sheer rhinestone studded dupatta. 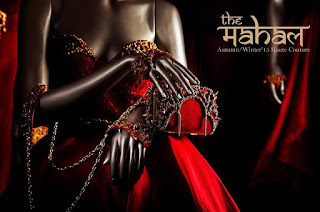 Ashima – Leena: Ashima - Leena's “Dakshna” will be a South Indian Bridal attire revelation. The hint of the bride with decorated braid and crown jewellery will become a reality soon. Gauri and Nainika: Gauri and Nainika will be displaying cocktail wear at the BMW Fashion Week 2015. Their teasers reveal addition of texture to fabric through ruched floral petals arranged in patterns. Shantanu and Nikhil: The designers' preview of bold red couture invites us to indulge in their collection. They will be presenting “the Mahal” collection at the BMW Fashion Week 2015. 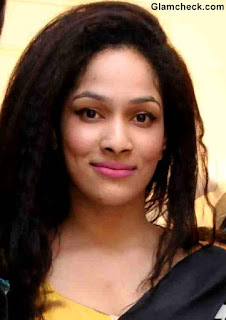 Rina Dhaka, Jyotsna Tiwari, Falguni Shane Peacock and Sulakshana Monga are the other couturiers who will be displaying their bridal fineries at their absolute best. 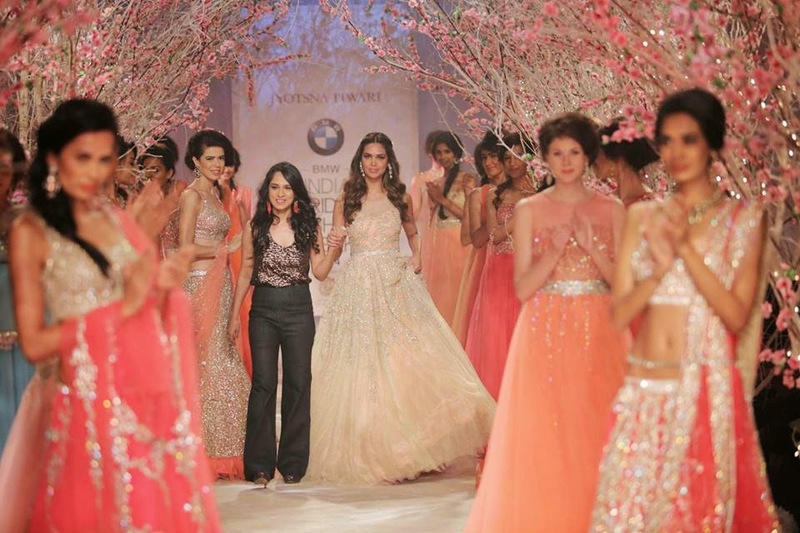 Last year the BMW Fashion Week saw lot of eminent Bollywood personalities gracing the runways as showstoppers. These well known faces included Shraddha Kapoor, Nargis Fakhri, Aditi Rao Hydari, Esha Gupta and Kangana Ranaut. 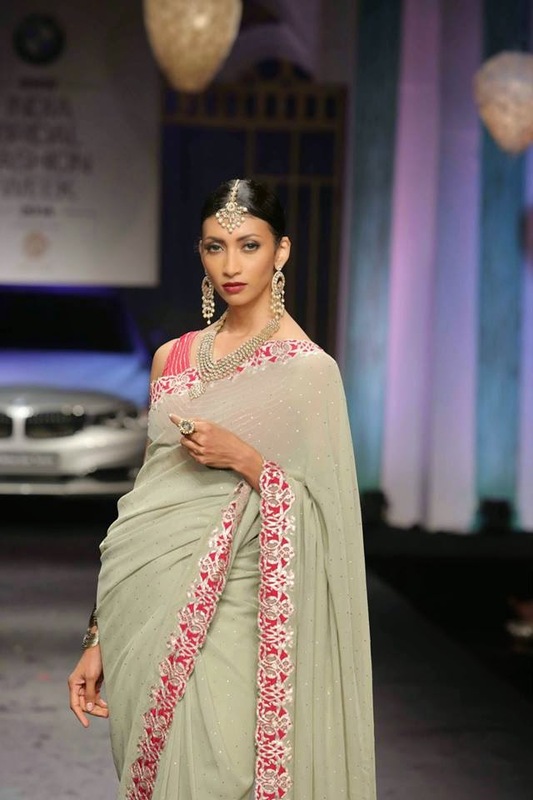 The BMW Fashion Week 2015 will see Lisa Haydon walking for Tarun Tahiliani. Sonakshi Sinha, the brand ambassador of the event will grace J J Valaya’s show. The magic of BMW India Bridal Fashion Week begins today, and its mystery will be unravelled leisurely across the seven cities of India over a period of time, finally ending in Chennai on November 22, 2015.
Who Makes to our List of Top 10 Indian Designers? Indian fashion industry has made its presence felt globally. Fashion connoisseurs across the planet take cue from India’s rich cultural heritage and fashion forwardness. The entire credit of taking Indian fashion to every nook and corner of the world goes to our very talented Indian fashion designers. Their belief and intense understanding of Indian textiles, fabrics and rich embroideries has let them carve their niche in the world of fashion. Though there are many ace couturiers whose contributions are commendable, but we have jot down the few names who we believe are the top 10 Indian designers. This is one name that needs no introduction. She is a diva and a true fashionista. Her designs are impeccable and her sense of fashion is beyond comparison. 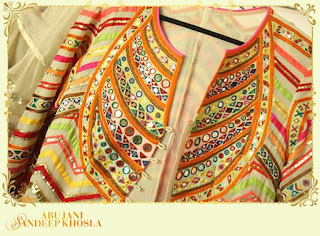 Known for her deep knowledge of traditional craftsmanship and vintage embroideries, she is the fountainhead of ‘boutique’ culture in India. Her designs are a hit among both commoners and celebrities alike. She has many accolades in her kitty including prestigious Padma Shri Award. 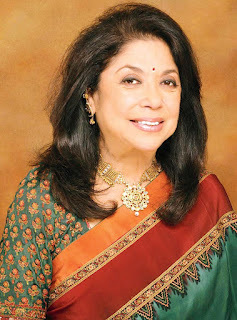 Ritu Kumar indeed gets the top slot in our list of top 10 Indian designers. 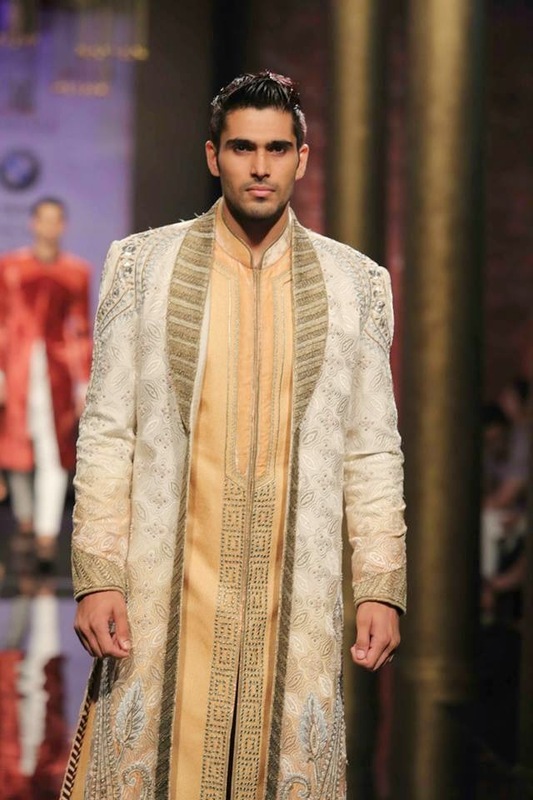 This man from the royal state of Rajasthan is next on our list of top 10 Indian designers. 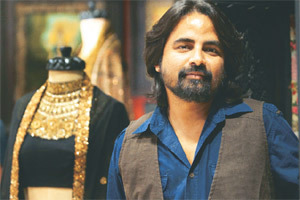 JJ Valaya is one of the nation’s most celebrated designers. Calling him the fashion revivalist won’t be an exaggeration. Valaya, knows his art like no other. His forte lies in fusion clothing with the perfect blend of modern haute couture and age-old craftsmanship. His work speaks for him and his designs are on every fashion lover’s wish list. Being one of the founding members of FDCI, JJ Valaya has seen fashion industry grow from an infant stage to the full bloom in his 20 years of dedicated career as a fashion designer. 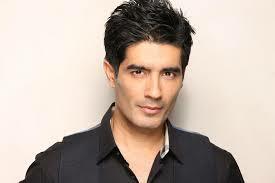 Manish Malhotra is undoubtedly the most loved designer among Bollywood actors. He has prettified bigwigs of film fraternity with his out of the world designs. This phenomenal designer has made his mark among the top-notch designers in India. His larger-than-life creations ooze glamour and sophistication. Every girl dreams to wear a bridal lehenga designed by Manish. His fashion career rose to the peak when he designed clothes for none other than the renowned pop icon, Michael Jackson on his tour to India. The singer was so impressed with Manish’s creations that he asked him to design for his other tours as well. That is why we proudly put the king of fashion on the third place in our list of top 10 Indian designers. 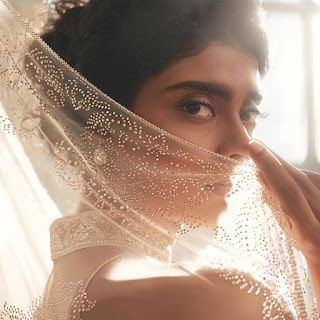 Sabyasachi has emerged as the rising star in the design circle. He is one humble man from Kolkata who let his designs do all the talking. His love for ancient Indian embroideries, embellishments, antique jewellery and vintage textile brings the old world charm in his designs. 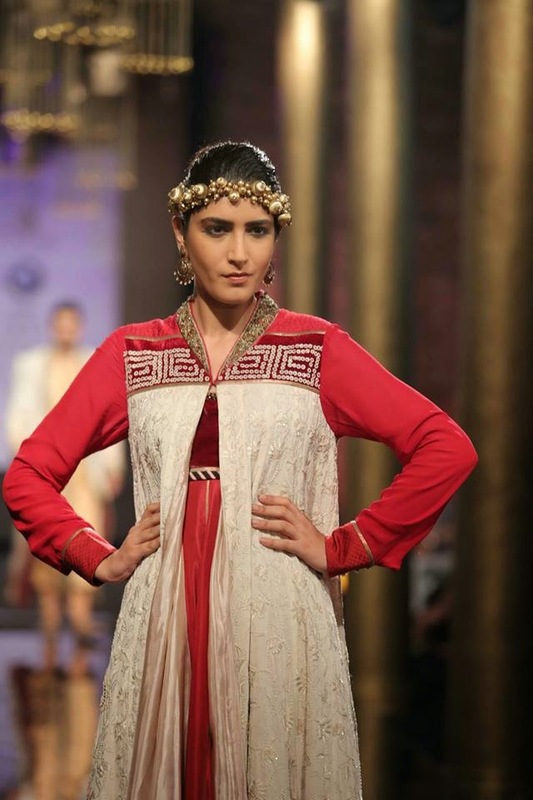 He has an eye for fine detailing and his forte lies in bridal and trousseau collection. He likes to blend the rich Indian culture with contemporary silhouettes. His originality and uniqueness has let him earn the title of being the only designer from India to present his collection at the prestigious Milan Fashion Week. No wonder, why he makes to our list of top 10 Indian designers. 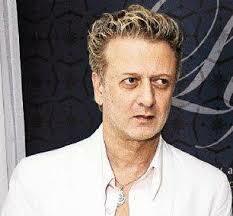 Rohit Bal justifies the title ‘India’s Master of fabric and fantasy’ given to him by the Time Magazine. He has redefined Indian fashion and has taken it to the international level. 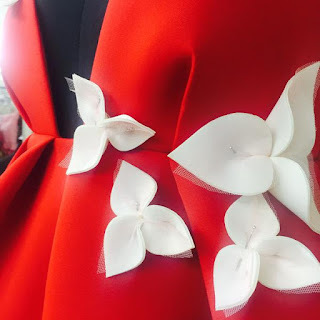 His clientele includes who’s who of Bollywood, Hollywood, media and big corporate houses who respect and appreciate his signature style of strong aesthetics combined with the sheer attention on fine details. The designer is blessed to have the access to the best material and talent in the industry. His approach towards fashion is ecstatic and exquisite which is prevalent from his impromptu dance performances at the end of every collection he showcases at fashion weeks. 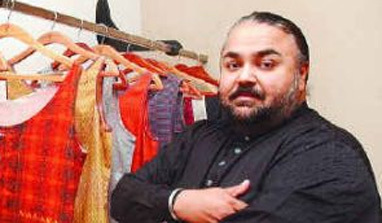 So, without him, our list of top 10 Indian designers is incomplete. 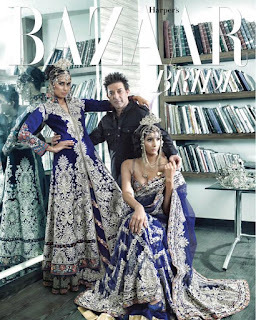 Abu Jani and Sandeep Khosla make the awesome twosome designer duo. Together they create nothing but history with their designs. Their profound understanding of Indian fashion has let them make their noticeable place in the fashion circuit. Their sense of styling is both individualistic and complimentary at the same time. This designer duo has earned recognition especially for their ethnic wear. We would happily place them at the sixth position among the top 10 Indian designers. He lives fashion, he breathes fashion. After completing, his graduation in fashion from New York, Tarun Tahiliani realized the huge potential for designer wear in India. Keeping this in mind, he worked hard to revolutionize the Indian fashion industry as a whole. Now he is a proud owner of multiple flagship stores across the cities. His creations are unconventional and way beyond the obvious. So, without another thought we include him in our list of top 10 Indian designers. She is the reigning queen of prints. No one understands the impact of prints better than her. She is like the whiff of fresh air as she introduced quirky prints and flowy silhouettes when everyone else was revolving around the embroideries. Her designs are young, fresh and vibrant and are liked by people of all age groups. Her USP is quirkiness and she holds the title of being the youngest designer to open the Wills Lifestyle India Fashion Week in year 2010. Do we need to say more why she makes to our list of top 10 Indian designers? He is a man who dons many hats as he is not just a premier fashion designer but also a fashion journalist and trainer. His key to fashion is chic minimalism and he believes in philosophy that simplicity is the highest form of sophistication. His love for white color is prevalent in his collections. Being from the beautiful state of Goa, he promotes local Goan artists and craftsmen by organizing exhibitions and fashion shows. 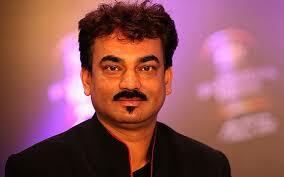 Wendell Rodricks is on number nine on our list of top 10 Indian designers. Last but certainly not the least; we conclude our list of top 10 Indian designers with Manish Arora. He is an acclaimed Indian designer whose designs are handcrafted to perfection. His collections are high on lively colors that give him an edge over the others. Apart from designing clothes, he has keen interest in cosmetics as he collaborated with the international cosmetic line Mac to bring a new range of lip glosses and eye palettes with bright yellows and candy pinks. The Lakme Summer/Resort fashion show 2015 was held from March 18th to March 21st, at the Palladium, Mumbai. The highlight of the show was that, the most of the attention grabbing shows from the seasoned Lakme Fashion week designers, were held off site from the venue. The success of any fashion show lies with the power designers’ showcase and the promise that the young talent displays. The Lakme fashion week designers put up an avant garde display at the event. The young Lakme Fashion week designers gave a lot of fresh perspective. Among them there are few notable ones. 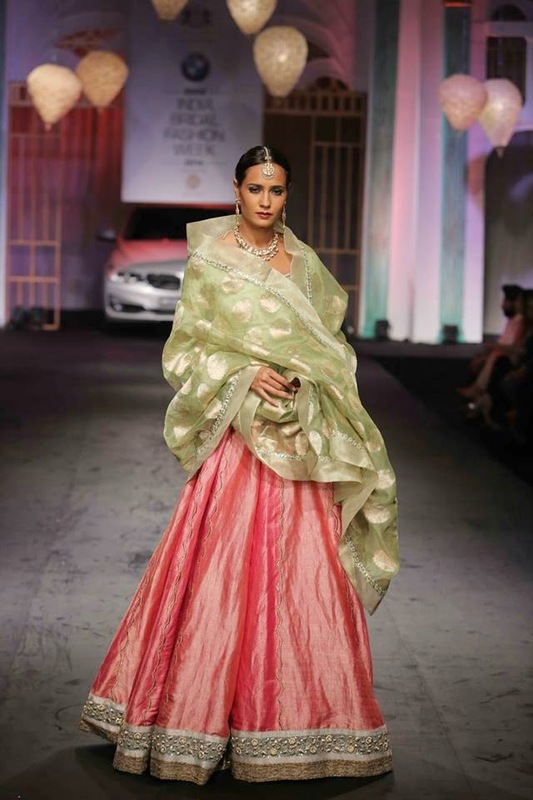 Anushree Reddy who is already popular with the bride in her 20’s presented her bridal wear with pastels combined with vintage floral prints, chevrons and stripes with a hint of bling. 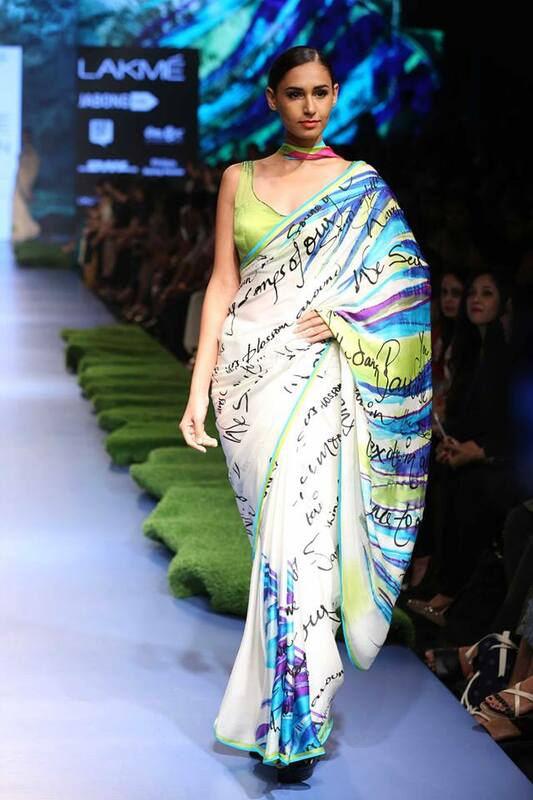 Mandira Bedi commenced the last day of the Lakme fashion week with her saree collection. She used a lot of colours with trendy cholis using banaras art on cotton and silk sarees. Neha Agarwal’s ‘From Russia, with Love’ collection showed Indo-Soviet outfits. The Russian prints and babushka doll imprint were seen on most of the skirts and tops. The showstopper Karisma Kapoor’s pink bodice with sheer embroidered cape and printed skirt was outstanding. Ken Ferns theme ‘the eternal sleep’ saw red poppy flowers sprinkled on all his black and white outfits. They even had a hint of blue and mostly were printed modern wear. 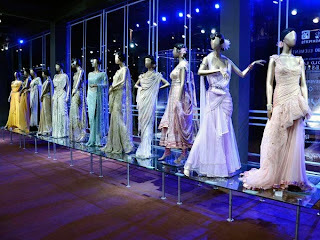 Karleo also presented a very western line with skirts, modern sarees and gowns. 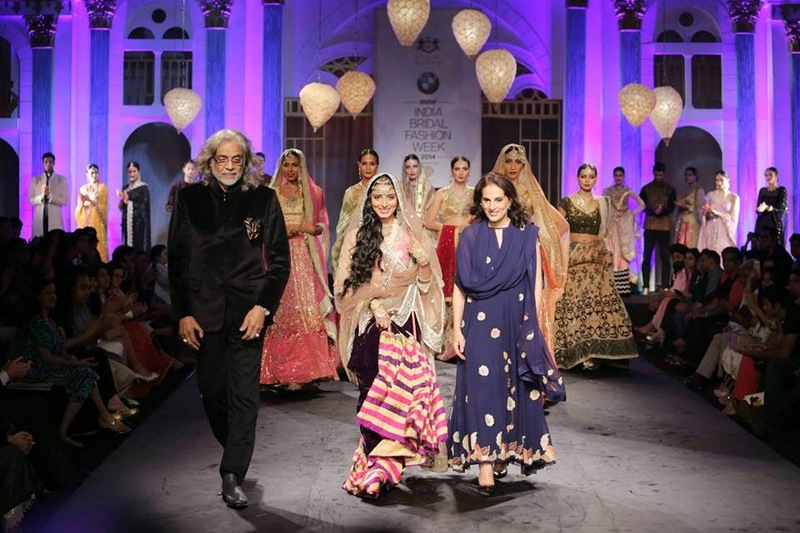 The young Lakme Fashion week designers did garner attention amidst the veteran glitz. There will definitely be an increase in the new Lakme fashion week designers every year from this year’s 39 new designers. From the veteran Lakme fashion week designers; there was some amazing work to watch out for. Sabyasachi commenced the grand show at the Richardson & Cruddas rundown mill with 120 dazzling looks. It portrayed the 70’s with bling, stripes, floral prints, solids and monochromes. 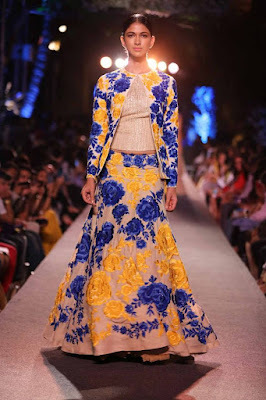 Manish Malhotra’s show ‘the Blue runway’ was presented in association with WEvolve. This opening night show was again off site at the old world ‘Great Eastern Home’. As per his theme his outfits were mostly bound by the colour blue and were traditional with contemporary approach. Suneet Varma presented ‘the decorative arts of India’ bringing forth the traditional techniques of different parts of India. He used a lot of mirror work and embroidery on shades and tints of reds and magentas. 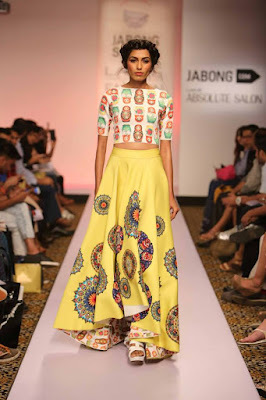 His mirror work shorts and pants stood out in the show, as did the gorgeous lehenga with crystals. Satya Paul by Gauri Khan saw contemporary sarees and flowy attires with tropical leaf motifs and modern prints. Tarun Taliani’s work was funky, blending in the cool and warm shades. The multicoloured prints used on kaftans, jackets and dhotis with turbans, made a lively presentation. The showstopper Chitrangada Singh said it all about Tahiliani’s show with her bohemian blue printed top with pink layered skirt. Wendell Rodericks’s ‘Popology’ took inspiration from pop art and used young bright colours in geometric patterns. Of all the Lakme fashion week designers, Anamika Khanna’s show was a memorable one. She brought the curtains down with her ‘Sculpt’ line. The show was held at Bhau Daji Lad Museum using a grand staircase as the runway. Justifying the theme the collection showed sculpted outfits with modern cuts and Indian aesthetics. The show presented lot of gold, gunmetal and silver with ivory and black. Kareena Kapoor who is the face of Lakme did the final walk down the staircase in amazing silver and black attire. The show ended on a grand note and the Lakme fashion week designers made the event happen with lot of originality, which will see us through this season. 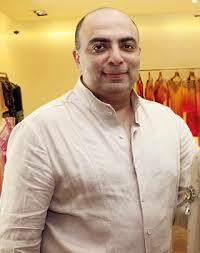 Tarun Tahiliani first launched his design studio in 1990, which has now lead to an extremely popular career in fashion design. His distinguishing signature style has since developed as a combination of intricate textile detail, sophisticated luxury, and extremely detailed tailoring. The Tarun Tahiliani Design Studio creates unique couture, diffusion and prêt-a-porter, which are all very traditionally Indian in their sensibility, but international and contemporary in their appeal. The rich heritage of the garments is reinvented as modern and on trend high fashion through the mastermind of traditional Indian craftsmanship, with the finest of Indian textiles; along with detailed Italian pattern cutting and new hi-tech technologies, such as digital textiles printing. His unique and beautiful combination of historical lavishness and innovative contemporary chic also lend themselves to Indian couture. Tahiliani, who graduated with a degree in Business Management from the Wharton School of Business, then gained an associate degree from the Fashion Institute of Technology in New York. He then gained the status of the first Indian fashion designer to be requested to showcase his designs at Milan Fashion Week. The Tarun Tahiliani brand sets out to produce the definitive "India Modern": Combining Indias most loved traditional techniques with todays current fashion trends and innovations such as western cuts, construction and finish whilst being crafted with Indian heritage and craftsmanship. 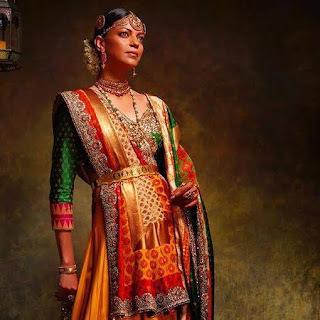 Tarun Tahiliani's new stunning couture collection embodies these elements by borrowing from India's rich and popular cultural roots, drama, and complexity and infuses it with subtleness paired with a fun playfulness. His newest collection consists of a burst of shimmering gold, soft hues of pastel tones and a distinctive whimsical bubbliness that is suggestive of a past era of charisma and elegance. Tarun Tahilani's key purpose within his collections is to create beautiful couture that preserves distinguishing Indian crafts, whilst investigating visions of sparkling crystals that reflects emotions for beautiful brides to be. Ask a typical Indian woman what she loves. The answer is simple: Bollywood and designer Anarkali suits. Indian fashion is rampant with all sorts of Anarkali suits. Short, long, gaudy, simple, basic, minimalistic, fancy, and the list goes on. 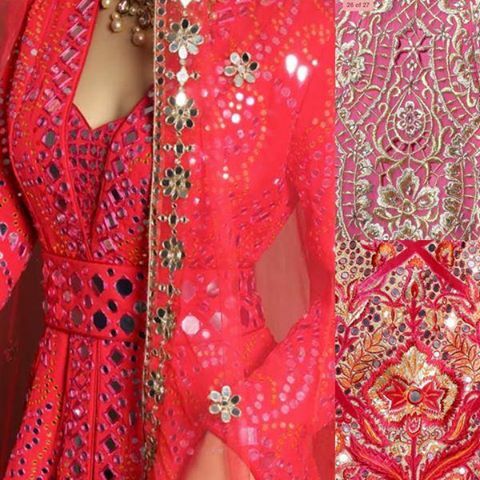 Our Bollywood beauties are no strangers to these extensive designer Anarkali suits. Knowing all you people so well, we’ve gone and taken the liberty to create a list that’s definitely going to help you select your designer Anarkali suits! Go ahead and feast your eyes. Don Draper is totally correct when he says ‘Make it simple, but significant.’ And Anushka Sharma does just that in this beige Abu Jani and Sandeep Khosla designer Anarkali suit. The whole look is so effortlessly chic, that we can’t stop our admiration. You go, Anushka Sharma! Kalki Koechlin rocks this black Sabyasachi Anarkali with the utmost elegance. This designer Anarkali suit is practically moulded to her lithe body and accentuates her delicate features. Hats off to Kangna Ranaut for opting for this uber colourful Manish Arora Anarkali. Only you, Kangna, can carry off this designer anarkali suit with obvious style and flair! Our favourite Bollywood diva of yesteryears, Sonali Bendre Behl, looks simply breath taking in this Abu Jani and Sandeep Khosla Anarkali. It’s difficult not to fall in love with this golden creation wrought with intricate mirror work. Jacqueline Fernandes walked the ramp for the brilliant Tarun Tahiliani, and how gracefully so. 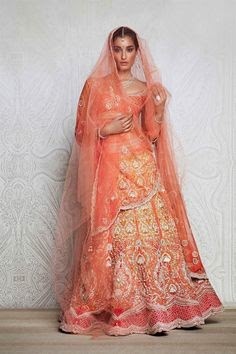 She looked ethereal in this orange designer anarkali suit. But it was when she did a perfect twirl that the audience held their breaths in awe and adoration! Madhuri Dixit couldn’t have looked more beautiful in this floral Anushree Reddy outfit. It’s the perfect fusion of simple and elaborate. The skirt has an ombre appeal due to the stunning orange hues. What makes this outfit really stand out is the heavily embroidered bodice. 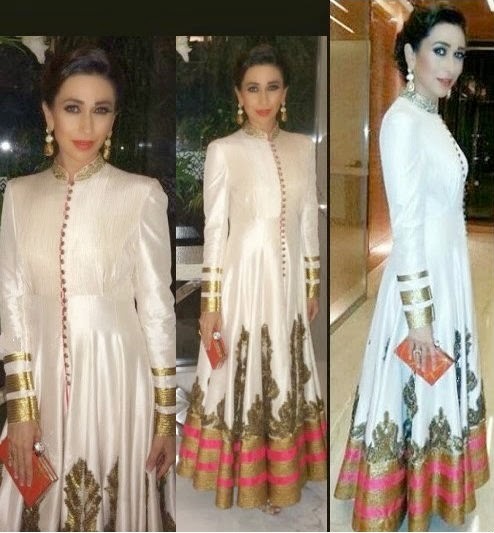 We have never seen anyone carry ethnic clothes off with so much panache as Karisma Kapoor does. 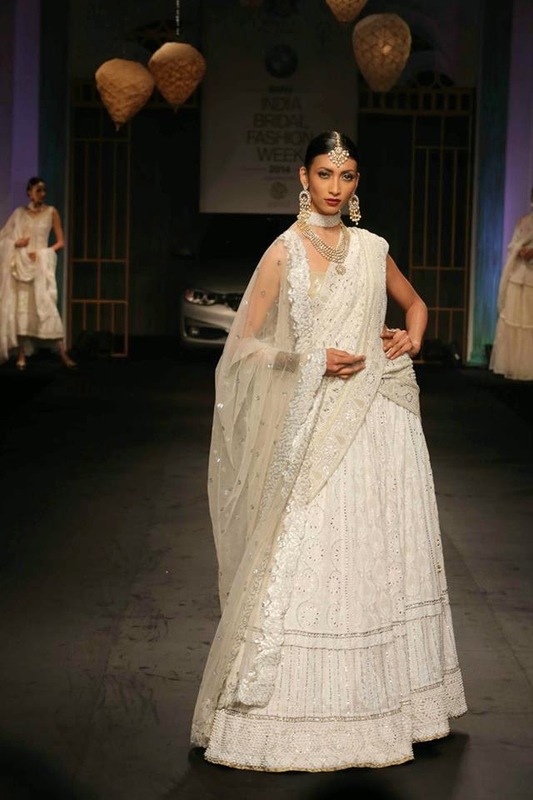 She wows us in this white Shantanu and Nikhil designer anarkali suit. The long trail of buttons and minimalistic accessories are just perfect. Not too little. Not too much. We have looked far and wide and our conclusion is that Bollywood’s resident fashionista Sonam Kapoor takes the crown for being most creative with her designer anarkali suits. She opts for soothing, soft colours and novel, unique designs that are sure to make a fashion statement. The first outfit is by Payal Pratap and gives the whole concept of Anarkali a very modern feel. Ridhi Mehra takes things to a whole new level with this gorgeous minimalistic outfit with the perfect amount of flowers to make it stand out. Bollywood’s new favourite is the emerging designer Shehla Khan. 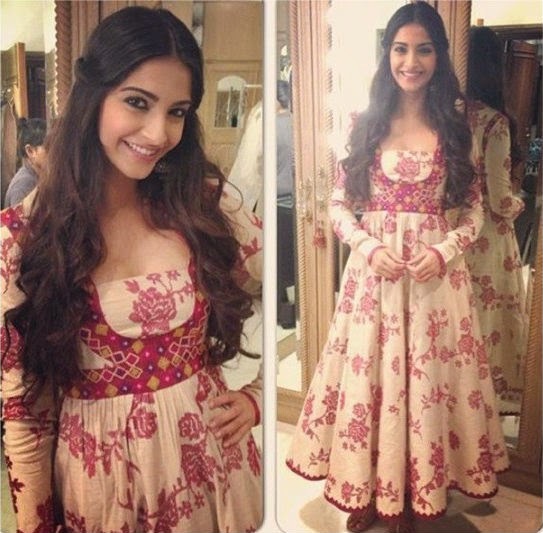 Sonam Kapoor looks exceptionally poised in this ethnic floral creation. As a rule, we’d like to save the best for the last. A woman’s dream designer is Manish Malhotra, no doubt. All he has to do his wave his magic fashion wand on Priyanka Chopra and the result is something so very exquisite and opulent that we are rendered speechless. One word: Bravo. Do you want to see more about celebrity style and Bollywood trends? 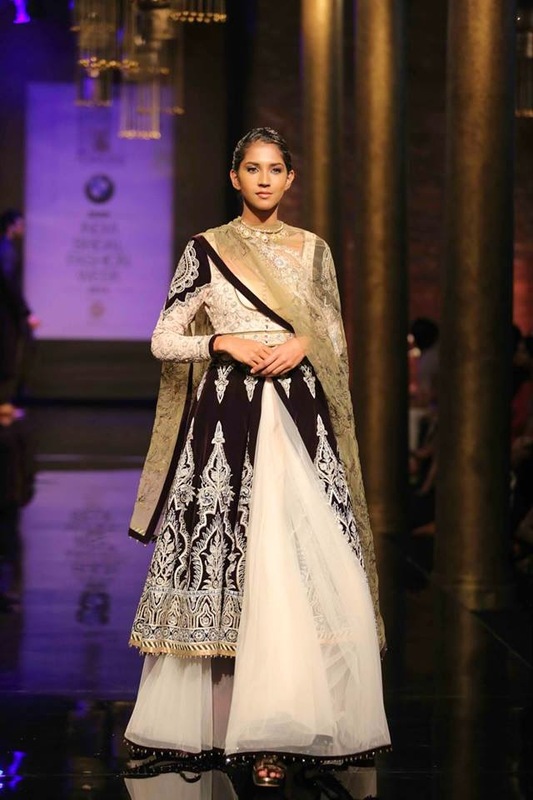 The talented designer Tarun Tahiliani presented his amazing creations of weddind saree and other elegant dresses at the 5th edition of his annual exhibition. The ability of Tarun is to create dresses based on traditional shapes and heritage, taking into account the necessities of the modern India. At the exhibition there were stunning wedding saree, in pastel colours, which range from yellow to green and from light purple to old rose. The colours itself are really elegant, however is the care of meticulous details that make the difference: crystal and precious stones create beautiful embroideries for all the length of the wedding saree and of all the other evening dresses. 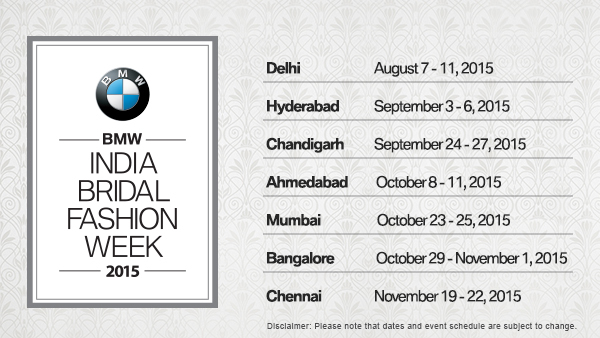 BMW is the sponsor of the Indian Bridal Fashion Week 2014 that took place in Delhi and is also going to take place in Mumbai. A lot of designers had their collection on the catwalk. They showed the latest styles of bridal clothes and also had a lot of bollywood celebrities on the catwalk wearing their clothes. 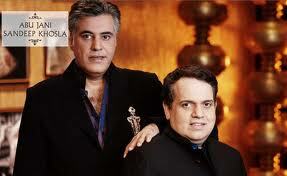 My favourite designers from the shows were Tarun Tahiliani and JJ Valaya. Jyotsna Tiwari's bridal collection was also very good. I liked the colours used in the collections - a lot of non traditional colours like Black and Blue, that is not normal for bridal clothes in India. The clothes were obviously very gorgeous and pretty but at the same time, they looked very expensive. There seem to be a lot of bridal shows in India, there was the India couture week and the India Jewellery Week that also finished recently. It is clear that Indians love the bridal clothes and are spending a lot of money on the clothes! See also this amazing outfits for grooms!